The brief for this project was to turn a freezing, nondescript home into a comfortable, high country, retirement retreat. The existing holiday home was situated in a dense mountain ash forest at high altitude, resulting in a sheltered, shaded, cold, and bushfire prone environment. Our clients wanted a light filled, comfortable home that maximised the potential of the existing structure. Our design response was to undertake a comprehensive thermal envelope upgrade – all walls, roofs and windows were upgraded throughout the home – while revisiting and improving the layout of the home. We re-purposed each room to ensure the best possible natural light for purpose, while minimising removal of existing structures and features. The hand-made window frames were retained with new double glazed units installed. 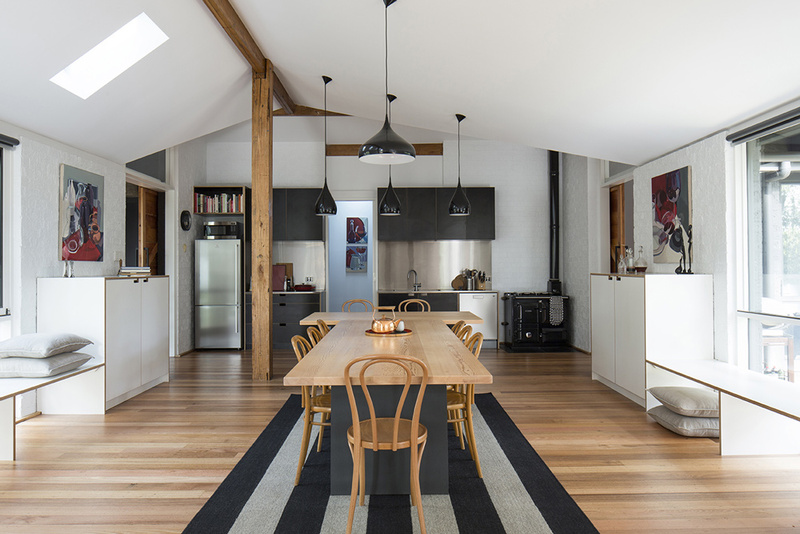 The high cathedral ceilings were heavily insulated, and the existing hydronic heating system upgraded and coupled to a new wood fired oven in the kitchen. The original brick cavity walls were insulated and painted to lighten the interior while still ensuring thermal mass for a more stable indoor comfort level. We completely reinvented this house, turning it from 0.2 star into a 6.0 star home in a beautiful, yet thermally challenging environment.